What is Post-Concussion Syndrome & How is it Treated? ?How Can a CT or CAT Scan Be Used to Diagnose My Brain Injury? ?I Had A Serious Concussion But The MRI Came Back Negative. What Does this Mean? The symptoms of concussions manifest over time, making the long term consequences of a brain injury often worse than initially anticipated. Post-concussion syndrome (PCS) refers to the persistence of symptoms of a concussion after the accepted time frame of recovery. While the accepted time frame of recovery will vary by age, medical history, and severity of the injury, most people recover from a concussion within a few weeks to a few months after the accident. The symptoms which constitute post-concussion syndrome are usually marked by the persistence of cognitive and behavioral symptoms that were the result of the injury. The symptoms can include permanent memory impairment, sleep disorders, deficits in problem solving, deficits in language use, personality changes, mood disorders, depression, anxiety, deficits in abstract reasoning, and deficits in judgment. The difference between symptoms of a concussion and post-concussion syndrome is when the symptoms from the concussion become chronic and life-altering. Those who suffer from post-concussion syndrome might find themselves unable to return to their previous lifestyles and employment. It is important to note that someone suffering from post-concussion syndrome can appear superficially normal to the average person. Brain injuries are often referred to as ‘invisible injuries’ for this very reason. It is only after you get to know a brain injury survivor and see how they struggle to find words, remember the topic of conversation and comprehend complex sentences that you begin to understand the depth of PCS. The chronic symptoms of PCS can make returning to life as it was before the accident impossible. Suffering from chronic headaches, fatigue, and the inability to concentrate for long periods of time can make it hard to return to work or school. While many people suffering from PCS retain knowledge they have learned, they may have trouble expressing information and may have trouble doing tasks at the same speed which they once did. Adjusting to a new, often slower, lifestyle can cause depression and anxiety. Although most people will recover fully from their head injury, as many as 15% of people with TBI’s will suffer from post-concussion syndrome for years, sometimes permanently, after their accident. The severity of the symptoms will vary from person to person based on many factors like their cognitive reserve, but because of their chronic nature of PCS, it generally requires those who suffer from it to adjust to a completely different way of life in order to live with their symptoms. 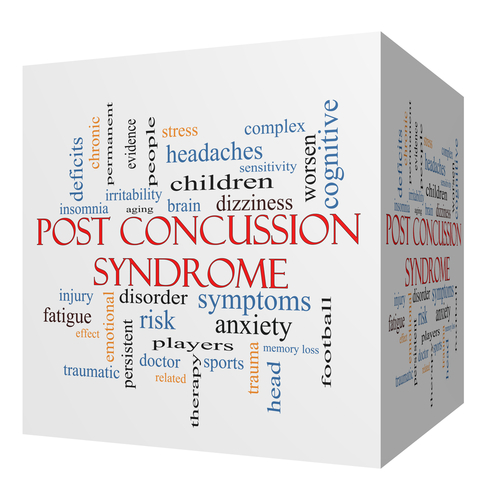 Treatment of post-concussion syndrome (PCS) is different from the treatment of acute concussion symptoms. Management of post-concussion might involve a multi-disciplinary team of primary care physicians, neurologists, neurosurgeons, and neuropsychologists who monitor changes in progress over the recovery period. Formal neural imaging tests like SPECT scans may be administered to monitor progress and manage complex concussions. These allow doctors to evaluate the function of the brain and watch it adapt to injury. It is important to keep track of symptoms of PCS through neuropsychological tests. Because of the invisible nature of concussions, thorough care must be taken to monitor the development of symptoms in order to identify the damaged brain cells and find the best course of treatment for recovery. A combination of neuropsychological therapy, physical therapy, and occupational therapy may be used for treating post-concussion syndrome. Patients may be prescribed anti-depressants for depression or pain medicine for chronic headaches. If patients suffer from sleep disorders they may have to see additional specialists and undergo specialized testing. Cognitive therapy is designed to help patients relearn activities and provide them with support through the lifestyle changes they will need to make in order to live with and adapt to their injury. Currently, in Florida, there are only three comprehensive inpatient rehabilitation centers for TBI: Tampa General Hospital Rehabilitation Center, Brooks Rehabilitation Hospital in Jacksonville, and West Gables Rehabilitation Hospital in Miami.